Barnsley & Barnsley, in conjuction with CCPD training, are holding a one day seminar on Friday 10th March 2017 at the Radisson Blu, Argyle Street, Glasgow. 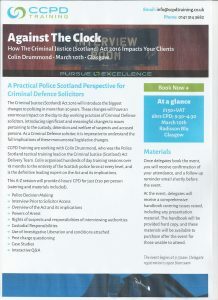 The seminar will highlight the importance of the forthcoming Criminal Justice (Scotland) Act 2016 legislation. The seminar will be delivered by Barnsley & Barnsley Associate and former Detective Inspector Colin Drummond.